For more than 96 years, the Pipes and Drums have been "instrumental" to the Regiment and its success. Ours is a rich history, where pipers and drummers have served their Regiment and country in both times of peace and war. With our Hodden Grey kilts and blue-tooried glengarries, the Pipes and Drums are perhaps the most visible, and consequently immediately recognized, unit of The Toronto Scottish Regiment. We have served as musical ambassadors for the Regiment at home, around the country and abroad. Most importantly, we work to fulfill our mandate as part of the musical services of the Canadian Forces, 32 Canadian Brigade Group (CBG). We provide musical support to Regimental and Brigade ceremonies and functions throughout the year. As well, we participate in more publicly visible venues, such as the Warriors' Day Parade at the Canadian National Exhibition, and parades and concerts in the Greater Toronto Area. 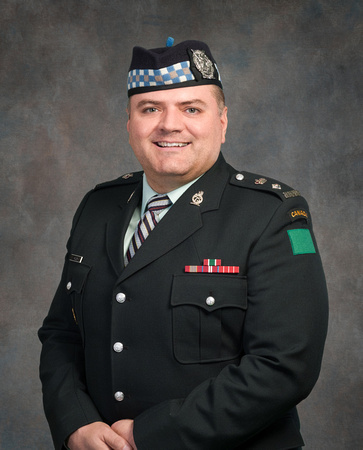 It is with great pride that we uphold the image and traditions of The Toronto Scottish Regiment, mindful of the long history of both our Regiment and the Band. The Pipes and Drums are under the leadership of Pipe Major Andrew Killick and Drum Major Billy Boulet-Gagnon. The Pipes and Drums operate with the kind permission of The Toronto Scottish Regiment Commanding Officer.